The scientific computing complex at the CEA facility in Bruyères-le-Châtel (DAM/Île de France) hosts one of Europe’s largest high-performance computing facilities, used for defence, industrial and research applications. It houses the large infrastructure operated by CEA DAM specifically for defence-related programmes, featuring the Atos/Bull Tera1000-2 supercomputer (with a processing power of 25 petaflops). The centre’s unrestricted area also hosts two large infrastructures as part of the CEA’s TGCC (Très Grand Centre de Calcul) facility. The first of these serves the needs of the European academic research community. 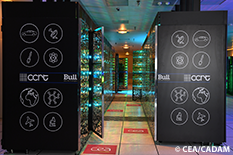 At its core is the Atos/Bull Joliot Curie petascale supercomputer; the CPU time is provided to European research organisations under the Partnership for Advanced Computing in Europe (PRACE) programme, and also reserved with French research labs, via a civil society named GENCI. The second large infrastructure, designed to serve industry, is supported by the CEA’s Research and Technology Computing Centre (CCRT), which hosts the Atos/Bull Cobalt petascale supercomputer, descendant of the Tera1000 class, used by industrial partners and CEA laboratories. These operational computing centres are supported by a technological experimentation and expertise cluster, which provides the research and development expertise crucial to managing the complexity of large computing infrastructures. The resulting computing complex is part of a broader effort to build a high-performance computing ecosystem. In keeping with this strategy, the CEA set up Ter@tec, an organisation that now has more than 80 industrial and academic partners.